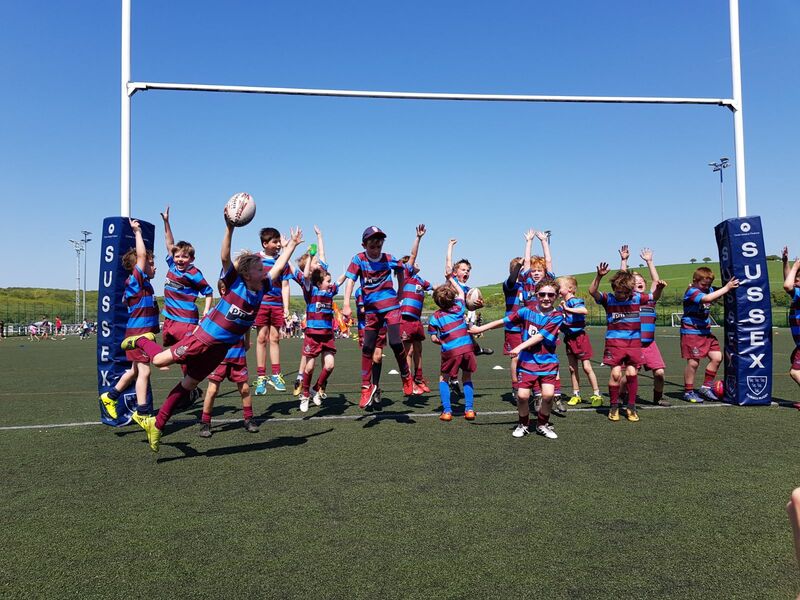 Cowdray Park was a fitting setting for the first festival of the season and the beginning of competitive contact rugby for our two teams of under 9’s. After some impressive work in the warm-up drills, coaches Matt, Marc, Paul and Ian had the boys fired up for their contact rugby debuts. First up for the Hove Hurricanes: Chichester….but not before a rousing speech from Matt (“look each other in the eyes - these are your team mates…”), all delivered to the backdrop of the historic Cowdray Ruins. Stirring stuff. The team showed no sign of the early morning wake-up call and were quickly out of the blocks with a great team move run in by Cameron. Some disciplined tackling followed, proving the team was more than ready to compete physically. After Chichester levelled, a powerful try from Griff broke some strong defensive play from Chichester on tackle six. A scrappier second half followed, with the Hurricanes’s receiving a reminder of what happens when the runner is allowed to reach top speed. Griff counters with the same approach, adding a couple of dummies for good measure. A diving tackle from Ted (completed with a smile) and further tries from Landi and Griff take us to the end of the game. Game #1 done, and a clear sign of a step-up in intensity and execution from last season. As the clouds briefly gathered, so arrived our now-customary ‘difficult’ game, with Midhurst 2 as the opposition. Despite missed tackles and turnovers on both sides we are level at half time, with a special mention to Grace of Midhurst for a great run to the line. The half-time rotation seems to disrupt the team initially and we trade turnovers whilst competing against the vocal prowess of the Midhurst coach. Despite further tries and a great tackle on Grace (Ted had read the half-time memo) we finished the game on the defensive. The post-match de-brief begins with: “So, what do you think went well in that game?”. You can guess the rest…. Haslemere provide an equally strong test, but we start well with an incisive try from Ben, who follows up with a great tackle. A scrappy passage of play is finally broken by a great cross-field pass to Luca, who accelerates to the line. Half time brings a chance to re-group and for Cameron to tie his laces. The second half starts at pace with great teamwork leading to an Oli try, a good point to mention his all-round tackling performance (and a worthy trophy at the end of the day). We’re on the ascendency, but the game stops early after a nasty knock to Landi, who receives a foil blanket and a hot chocolate for his troubles (and an an excuse not to do his maths homework, by all accounts). Old adversaries Bognor provide us with a chance to get back to running rugby with great team play feeding Griff and Cam, and a classic try from Ted on the diagonal at top speed. In the second half, the game play and discipline of Hove is clearly frustrating the Bognor players and we finish with a training ground move for a try (Ted in action again). With Cowdray Park emptying, the team has a long break before we line up against Worthing. What’s noticeable this season is how the boys retain their focus in the down-time - re-fuelling, practicing drills or cheering on their budddies. They take that focus into the final game, starting with Dan deploying his not-inconsiderable stride length for a great run. Tries follow from all areas of the pitch, the best following a deft pick-up from Luca, finished by Henry. Worthing collect a single consolation in the second half (to cheers all round), but Hove keep pressing with great combination play made possible by consistently good tackling and all round discipline. Impressive application for game #5. Heading home for what very little remained of Sunday, the feeling was of satisfaction that the boys had clearly stepped up their technical game but with much to take away to improve. First opponents: Worthing, who Head Coach Matt noted as one of the strongest sides. The first half was a tight, low-scoring affair with two highly combative tackling teams, leaving the match evenly poised at the break, Hove’s only try scored by the quick-footed Will. The intensity of the Hawks tackling increased second half, Senan doing great work in the centre, before bravely picking himself up after being carried off with a knock. As the half went on, Hove’s greater stamina prevailed with Albert, Oliver and Will running in some more tries. The Hawks were up and running. Next up Shoreham. at half time with tries from Albert and Dillon (2). Dillon and Senan (2) added tries in the second half, with some great switching of the play for Dillon’s to create space on the wing, while Will’s performance in defence gave everyone a lesson that you do not necessarily have to be the biggest player to be a great tackler. In the break between games, Paul drilled the Hawks hard in tackling and they took their lesson straight into match three against Petersfield, with some crunching early tackles from Leo and Ethan. The passing from the whole team was flowing in attack and they were always on top in this thriller – with Senan (3), Albert (2), Sam & Dillon on the score sheet – the defensive line became a little disjointed, allowing Petersfield to return three tries from the last three restarts. So, to our fourth and final game and our impressive hosts Midhurst. A close first-half ended, with Albert converting in the corner before the opponents’ lightning quick winger had added his second try. The second half started at pace with Midhurst attacking down the wing, Dillon executing a perfect last-ditch tackle into touch to provide the Hawks with a well-needed turnover. Hove responded, but once again Midhurst’s star player evaded a series of missed tackles to run in a couple more tries. All was not lost, though, and the Hawks showed great tenacity to stay in the contest. Dillon ran in his fifth try of the day to cut the deficit, before Albert went on a trademark jinking run nearly the full length of the field, before he was felled inches from the line by the tackle of the day from Midhurst’s smallest player. This inspired Midhurst, their little master once again breaking through a tiring Hawks defence for his and his team’s next score. A very spirited performance from the Hawks against tough opposition on their home turf. After the final whistle, coach Paul gathered the boys for their post-match huddle. A fantastic effort from every member of the Hawks team, a great outcome for the first festival of the year and lots of positives to build on for the rest of the season. Roll on the rest of the season!